We’re helping build a school for orphans in D.R. Congo! We’re helping support women victims of war in Burundi! We’re providing resources for police programs in Uganda! The Global Family Program from International Cities of Peace™ provides a person-to-person, city-to-city method to help with specific programs. Each donation is returned with a verifiable receipt. No middlemen, no corruption, no salaries paid, just peace building at its finest. 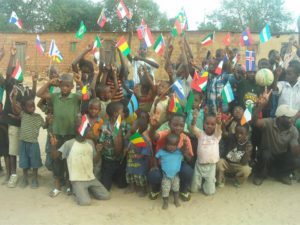 Case Study: As a result of the urging of the City of Peace team in Sedona, Arizona, John Mukhutu, leader of the City of Peace in Kowelzi, D.R. Congo, arranged a meeting with the local Rotary. The Chief of that region (the head of government) was so impressed with John’s presentation that 10 acres and 10,000 concrete blocks were given to the project. You can match that level of local support with a moderate donation. And you can watch these orphans thrive. Dedicate your donation to someone you love! 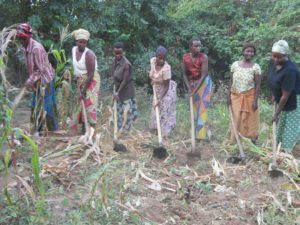 Case Study: Last year, together, we provided funds for the abused and ostracized women of Bujumbura, Burundi — seeds and land for their gardens, fees for their children’s schooling, housing and medicines. We told them up-front it would be just for one year. We did great. One of our colleagues even bought them a used computer so their children would have a window to the world. Thanks to everyone who contributed. We also encouraged their leader, Furaha Soleil, to ask the women to consider starting a business. We gave them a little support. Only they can empower themselves. We are happy to report the women of Burundi have developed a business plan! “The group of vulnerable women that we represent is composed of 102 widows, those contaminated by AIDS or who have been raped and driven from their husbands or are considered witches. All are poor women who live in either Buterere or Mutakura on the outskirts of Bujumbura, capital of Burundi. “Grouped within the Union of Women for Peace, our association is a member of International Cities of Peace and campaigning for peace, non-violence and our overall well-being. The “Two Beads Red , One Human Heart” project initiated for us by ICP has enabled some of us to be treated, pay rent of our homes, pay studies for our children, allow us to have a computer, buy equipment for agriculture and to have a field to cultivate. What a relief for our group! “Now we wish to start a small breeding of goats business. This will allow us to have milk for our own consumption, fertilize our fields and have income by selling milk or small goats that will be born. This will increase our revenues, make more cohesion and solidarity of our group and we will live better. “Here is the budget for this profitable activity. Purchase 8 goats for $720; Construct a shed for $180; buy medications for $50; and purchase rope for $10. No obligation, but it sure tugs on the heart strings. 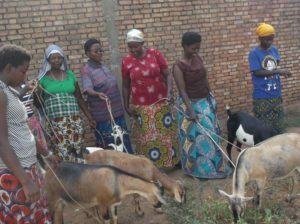 If you would like to help these women start their Eight Goats business to keep their children in school and food on the table, please do… $50? $100? $500? To them, so little is so much! As usual, receipts for their purchases are provided and no salaries are paid, so all funds go directly to the women. If you prefer, mail check or money order made out to “International Cities of Peace” to the address below. All work is done by volunteers. The organization is a 501(c)3 so your donations are tax deductible. Questions? Contact a volunteer today. Thank you!